November 9 is a momentous date in German history. On this date Robert Blum, one of the leaders of the 1848 revolution in German-speaking countries, was executed in Vienna; the Nazis instigated the infamous Reichspogromnacht (sometimes called, in a softer version, “Kristallnacht”) and when the Berlin Wall was opened in 1989. But above all, it marks one of the most significant stages of the 1918-1923 German revolution, the date when the Kaiser was overthrown and a republic declared. Internationally, this date is sometimes overshadowed by the signing, on November 11, 1918, of the Armistice ending formally the central fighting of the First World War. But the two are linked. The timing of the armistice was largely due to the ruling class’s general fear of revolution following the October revolution in Russia and that revolutions had broken out in both Germany and the Austro-Hungarian empire is hardly mentioned. In Germany and the successor countries to Austro-Hungary, the story is more mixed. The workers’ revolutions are mentioned but then usually downplayed as emphasis is given to the end of autocratic monarchies and the winning of national independence. For socialists today, this revolution is not a historical subject. There are important lessons to be learned as, fundamentally, it is the story of a missed opportunities to overthrow capitalism. Germany 1923 saw the end of the revolution that had begun in 1918 but also was the one occasion, so far, when a majority of the working class in an industrialised, imperialist country supported a revolutionary Marxist party, in the shape then of the German Communist Party (KPD). Already for many years Marxists had seen Germany as a key country, both because of its very strong, Marxist-led, workers’ movement, and because of its economic power. Despite its defeat in the First World War and the subsequent reparations, Germany was still the decisive country in Europe. In the early 1920s Berlin was the fourth most populous city in the world and, internationally, the largest industrial city. When, in 1918, the German November revolution began, almost exactly a year after the Bolsheviks had come to power, Lenin was ecstatic. Krupskaya, his wife, later wrote that that Lenin was “completely carried away by the news” and that “the days of the first October anniversary were the happiest days in his life”. Not only because of the overthrow of the Kaiser and the probable end of the First World War, but also because Lenin, Trotsky and the Bolsheviks understood that the ultimate fate of the Russian revolution was tied to the success of the socialist revolution in the rest of Europe, particularly Germany. As the German and Austrian-Hungarian revolutions began Lenin wrote to the Soviet leadership that “the Russian proletariat is following events with the keenest attention and enthusiasm. Now even the blindest workers in the various countries will see that the Bolsheviks were right in basing their whole tactics on the support of the world workers’ revolution”. But, as we bitterly know, the German revolution did not succeed and, instead of the creation of a socialist society, capitalism continued. Not only did this failure result in the horrors of fascism and the Second World War, it also opened the way to the victory of Stalinism in Russia and ultimately the complete undermining of the gains of the Russian revolution. 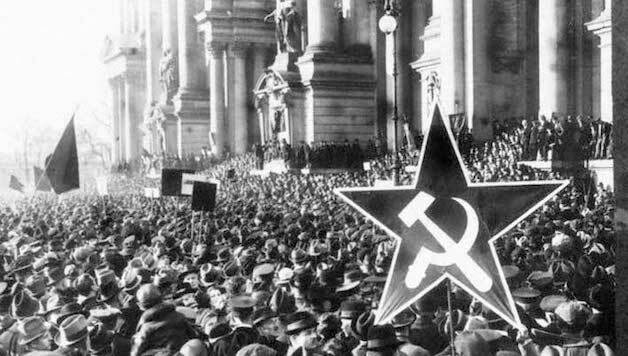 Alongside its historical importance in helping set the course of the twentieth century, the story of the German revolution between 1918 and 1923 contains many important lessons for Marxists today. It is, so far, the only example of a revolution unfolding over a number of years in a modern, industrial country and can illustrate many questions of programme, strategy and tactics that will face Marxists in the more stormy times we are entering into. In particular these questions centre around how a mass Marxist party can develop, how it can win majority support in the working class and, ultimately, what it should do when it reaches that position. Alongside Germany’s economic strength a key element in this revolution was the power of its workers’ movement. Before the 1914-18 war the SPD was internationally seen as a model and was the leading party in the Second International, which then fundamentally comprised Marxist parties. The SPD had paved the way in building massive working class organisations that, formally at least, had the aim of overthrowing capitalism. Rejecting the “revisionist efforts” to formally commit the party to simply attempting to reform capitalism, the 1901 SPD congress, for example, condemned attempts “to supplant the policy of the conquest of power by overcoming our enemies with a policy of accommodation to the existing order”. Organisationally the SPD enjoyed massive growth. After emerging from 12 years of illegally in 1890 the SPD’s vote increased in every national election, reaching 4.25 million (34.7%) in 1912. The following year its individual membership peaked at 1,085,900. However the SPD’s revolutionary heritage was being undermined by a combination of illusions sowed by that period’s economic growth and, paradoxically, the year by year growth of the SPD itself. Most of the leading layers within the SPD and trade unions began to assume that the movement would continue to progress almost automatically until it won a majority and that step-by-step reforms would steadily improve workers’ lives. Over time this led to the de facto abandonment of the expectation that crisis would grip the system, and of a revolutionary perspective, as the majority of the leadership thought that capitalism would carry on generally steadily developing. It was the outbreak of the war that brought out into open that the majority of the SPD leadership had clearly adopted a pro-capitalist position and would, in future, oppose a socialist revolution. This was the essential meaning of the turning point of August 4, 1914, when the SPD voted to support ‘their’ side in this inter-imperialist war waged by what were, at best, only semi-democracies. The possibility of war had been widely discussed for years in the workers’ movement, but what was a complete shock was that in most combatant countries the parties of the Second International immediately decided to support their ‘own’ side, with the only exceptions being in Russia, Bulgaria and Serbia That the SPD decided to support this war, unlike its opposition to the 1870 Prussian-led occupation of France, and collaborated with the government, was a stunning blow that effectively marked the end of that party’s claim to be revolutionary. This was a decisive step towards the SPD leaders’ integration into the capitalist system and prepared the way for the openly counter-revolutionary role they played after 1918. But this was not entirely a bolt from the blue. Already before 1914 there had been a sharpening political struggle within the SPD. Rosa Luxemburg, in this period, became the leading opponent of the growing reformist, non-revolutionary, trends within the party. By 1914 the SPD was divided into three tendencies: the openly reformist wing; the so-called centre (led by Kautsky); and the radicals (i.e. the Marxist left) led by Luxemburg, Karl Liebknecht and others. But, unlike the Bolsheviks in their struggle between 1903 and 1912 in the Russian Social Democracy, Luxemburg did not draw together the Marxist wing into a coherent opposition that systematically fought both for its ideas and to build support. Tragically this contributed to their weakness at the beginning of the revolution in 1918 and to the subsequent lost opportunities and defeats. Right from 1914 there was opposition to the SPD leaders’ pro-war line from amongst many activists defending the party’s up to then traditional socialist internationalist position. But, for a time, they were swamped and relatively isolated by the patriotic wave that initially swept all the combatant countries and faced increasing repression from both the SPD leadership and the military authorities. Furthermore the internationalists were not particularly well linked together in terms of a common, clear programme or activities. Partly the anti-war SPD members had been hit by a new experience, hardly any expected the SPD to be pro-war, and at worst many left wingers thought the SPD leadership would try to be ‘neutral’. Lenin, at first, did not believe the news that the SPD had voted in favour of the war. But the SPD left’s lack of political and organisational coherence made it far more difficult to respond. Nevertheless as it became clear that the war would not be a short one, as news spread of the horrific slaughter of trench warfare and as food shortages developed at home, opposition to the war mounted. Relativity soon protests against both the war and its effects, particularly on prices and sometimes drastic cuts in food supplies, began to develop on the streets, in workplaces and in parliament. In the SPD and trade unions struggles and splits developed. By 1916 strikes were taking place on the issues of food supplies and wages and, after the May 1 arrest of the left anti-war SPD MP Karl Liebknecht, there was a 55,000 strong protest strike in Berlin. In December 1914 Liebknecht had been the first out of the 110 SPD MPs to vote against the war. A year later 20 SPD MPs voted against and 24 abstained. Opposition to the war received an enormous boost from the 1917 Russian revolution, both the February overthrow of Tsarism and October’s Bolshevik victory. Partly this was because one of the main justifications the right wing SPD leaders give for supporting the war was the threat from Tsarist Russia, an even more undemocratic state than Imperial Germany. The February revolution’s sweeping away of the Tsar and the winning of democratic rights in Russia undermined the SPD leaders’ arguments, but significantly this did not change their support for the war. Immediately for many German workers Russia became an example of overthrowing a monarchy and establishing a republic. In particular the ‘soviets’ (councils) formed by the Russian workers, soldiers and peasants became an example. The strikes of around 300,000 workers in April 1917, particularly in Leipzig, saw the first formation of workers’ councils (called Räte) in Germany. Alongside a growing radicalisation amongst workers, unrest was spreading within the military with sailors forming a secret organisation. The appeal of the Russian revolution grew enormously after the October revolution, when power passed into the hands of Bolshevik-led soviets. A key factor in this was the Bolsheviks’ consistent policy of consciously appealing to workers in the rest of Europe, particularly in Germany, to follow the Russian workers’ example of winning democratic rights, ending the war, and overthrowing capitalism. Against this background the January 1918 strikes were even more widespread. The slogans of ‘Peace, Freedom, Bread’ were close to the Bolsheviks’ ‘Peace, Land, Bread’ and in Berlin half a million workers struck for five days in protest at the government’s annexationist demands at the Brest-Litovsk peace talks with Soviet Russia. Significantly the SPD leaders, while saying they supported workers’ economic demands, still argued that they should work for ‘victory’ in the world war. Almost from the war’s beginning the anti-war left faced obstacles. Alongside the impact of being largely initially caught by surprise, the anti-war left saw both the state and the SPD leadership moving against them using censorship, military call up and repression from the state and within the SPD a determined drive to silence opposition. More fundamentally the question was what lessons and conclusions needed to be drawn from this turning point of the SPD’s transformation from a weapon to be used to overthrow capitalism into an instrument to that was seeking to secure capitalism. This was a new experience in the workers’ movement, while there had been examples of individuals rejecting the idea of fighting for a socialist revolution and others openly supporting capitalism, this conversion of the bulk of the Socialist International’s parties was then unprecedented. What was needed was a clear programme and a clear approach towards those workers who still supported the SPD out of a mixture of past loyalty, hopes that it would be still be an instrument for change the working class and not fully understanding the issues posed by the SPD’s transformation. But the past failure to organise the revolutionary elements within the SPD made it more difficult to draw the necessary political and organisational conclusions. The February 1916 publication, in Switzerland, of Rosa Luxemburg’s ‘Junius’ pamphlet had a big impact on the anti-war left in Germany. However in his review of the pamphlet Lenin, while saying that “on the whole it is… a splendid Marxist work”, commented that it gave a “picture of a lone man” struggling and that unfortunately the German left, working in a semi-dictatorship, suffered from a “lack of compact illegal organisation”. January 1916 saw a meeting of supporters of Die Internationale – the paper Luxemburg had helped launch – adopt her thesis on the war and establish the Gruppe Internationale, which rapidly became known as the Spartacists, after the series of Spartacus Letters they issued from 1916 onwards. Luxemburg feared that organising an independent revolutionary organisation could lead to isolation from broad masses that still looked to SPD (and later, after it was founded, the USPD). But while Marxists had to avoid creating a sectarian barrier between themselves and the broader working class, non-organisation was not the answer. Without organisation there would be no arena where ideas and experiences could be discussed, proposals formulated and implemented in a concerted way, Luxemburg, reacting from the way in which the SPD’s organisation had become a bureaucratic obstacle to workers’ struggle, believed that when workers were in struggle the necessary political clarity and organisation could spontaneously develop. The growing opposition to the war and anger at what was correctly seen as the SPD leaders’ betrayal was reflected in struggles in the SPD. While the SPD leadership had passed over to the side of the ruling class, within its ranks were still many who supported the party’s Marxist traditions and anti-war policy. These tensions were also reflected at the SPD’s very top, in its parliamentary fraction. After less than two years into the war 20 dissidents were expelled from the parliamentary fraction. The divisions in the SPD continued to grow until, in April 1917, the split was formalised with the establishment of the left-wing and anti-war Independent Social Democratic Party, the USPD. This was provoked by the expulsion of anti-war oppositionists from the SPD the previous January, after they had organised a national conference. The new party took between a quarter and a third of the SPD membership. Its strength varied from area to area: in Berlin, Leipzig and four other areas, the entire SPD district organisational structure joined the USPD. The new party had about half its membership concentrated in Berlin, Leipzig and the Düsseldorf-Elberfeld area. Politically the USPD was a very mixed formation. It included representatives of the pre-war reformist wing, like Bernstein, who were against the war from a pacifist viewpoint. Kautsky, a leading representative of the pre-war Centre tendency, was also a member. At the same time the USPD included many who were moving in a revolutionary direction, which was the reason why Luxemburg, Liebknecht and the Gruppe Internationale joined it. Suddenly, very rapidly the situation changed in mid-1918. The failure of the German army’s spring offensive and the arrival of growing numbers of US troops convinced the military leadership that the war could not be won. On September 29 they requested that the government ask for a truce. Not wanting to take political responsibly for admitting the war was lost, and wanting to use the parliamentary leaders as a cover, the generals gave up their dictatorial rule. The first ever German government formally responsible to parliament rather than the Kaiser was formed which then, in mid-October, asked US president Woodrow Wilson to help negotiate a truce. Significantly, in an open break with its past, the SPD supplied two ministers, one also being the vice-chair of the trade union movement, to sit in this capitalist coalition government, headed by Price Max von Baden. The spark that set the revolution off was a naval mutiny in Wilhelmshaven that spread to Kiel when sailors refused to engage in a meaningless last battle with the British navy. This led to a clash in Kiel on November 3 when seven demonstrators were killed and many injured. As the sailors sent emissaries throughout Germany, the revolutionary upheaval spread throughout the country within days, with workers’, soldiers’ and sailors’ councils being formed in many cities, towns and ports. Events moved rapidly. November 9 saw the SPD leaders reluctantly declare a republic and, after von Baden’s resignation, agree to his proposal that the SPD leader Friedrich Ebert become chancellor (prime minister). The very next day Ebert accepted the offer from the new army chief, General Groener, of a “common front against Bolshevism.” Desperately the SPD sought to find ways to control the situation. Understanding the revolutionary mood they sought to appease the working class and rebelling military rank and file while trying to ensure that the capitalist system continued. Desperate to give the appearance of being revolutionary the SPD-led government formed the next day took the name ‘Rat der Volksbeauftragten’ (RdV, ‘Council of People’s Commissars’), which could be translated as exactly the same name as the Bolshevik government in Soviet Russia. But while the name was virtually the same there was a fundamental difference between the SPD government working to save capitalism and the Bolshevik government striving to end it internationally. At the same time the SPD moved to try to neutralise the left, under the slogan ‘unity of the working class’, by involving the USPD in the new government by giving it three People’s Commissars, the same number as the SPD. The SPD even hinted that Liebknecht, newly released from prison, would be ‘welcome’ in the government, something that he correctly refused. The USPD leaders had the illusion that they were entering the government “in order to safeguard the gains of the socialist revolution”. At best the USPD leaders were indulging in wishful thinking, as the SPD leaders had already made clear that, while they could still use socialist phrases, their aim was to safeguard capitalism by preventing the Russian October revolution being repeated in Germany. The SPD leaders had a conscious policy to prevent the overthrow of capitalism. On the eve of the Kaiser’s abdication Ebert, the SPD chair, complained that “if the Kaiser doesn’t abdicate the social revolution is unavoidable. But I don’t want it; indeed I hate it like sin”. Using the prestige of the SPD, still seen by many German workers as ‘their’ party, the SPD leaders strove to win time for the stabilisation of capitalism. In some areas it was the local SPD leaders who took the initiative in forming councils, in order to ensure they had control of them. The revolution brought demands for ‘socialisation’ (nationalisation under democratic control) so, as both a gesture towards this demand and as a way to sideline it, the RdV decided in mid-November to establish a committee to see which industries were ‘ripe’ for socialisation (needless to say nothing came out of this body). When the first National Congress of Workers’ and Soldiers’ Councils opened in December Ebert declared that “the victorious proletariat will not institute class rule”. Again learning lessons from the Russian revolution the SPD leaders sought to quickly minimise and then sideline the councils. The December National Congress of Councils did not really represent the forces, the workers, sailors and soldiers who made the November revolution; there were still many illusions in the SPD which its leadership exploited while using its apparatus to secure delegates. Only 187 out of the 489 delegates were wage or salaried workers while 195 delegates were full time party or trade union officials, the vast majority, 164, with the SPD. Officially the SPD had altogether 290 delegates, while the USPD had 90 delegates, about 10 of whom were Spartacists. Outside the USPD another 11 delegates supported the revolutionary Bremen Left. On this basis the SPD secured a 344 to 98 vote rejecting declaring a socialist republic and instead calling elections in January for a national assembly, with the clear aim of writing a constitution for a capitalist republic. But the revolution was moving quickly, especially in Berlin and some other areas. Sections of workers, soldiers and sailors were, within weeks of the revolution’s start, frustrated and angered that the old regime and the capitalist system had not been completely finished off. At the end of November left-wing protesters in Berlin were shot at, and early December saw 14 killed in Berlin by government supporters firing on a revolutionary soldiers’ protest. Two days later there was an attack on the Spartacus daily paper, Die Rote Fahne, and an attempt to seize Liebknecht, which led to a 150,000-strong protest demonstration the next day. Facing this radicalisation and growing support for the left, the SPD leaders attempted to reassert control. December 24 saw an attack on the People’s Naval Division (Volksmarinedivision), a force that originally had been sent to Berlin to safeguard the SPD but which had become increasing radicalised. After it had participated in a Spartacist-led demonstration and held hostage Otto Wels, an SPD leader, the government ordered that 80% of its forces be discharged. When the sailors refused this order the SPD sent other military units to attack them, resulting in the so-called ‘Bloody Christmas’ when the sailors successfully defended themselves. This led to the final crisis in the SPD-USPD coalition, with the USPD People’s Commissars resigning on December 29 on the issue of the ‘Bloody Christmas’ and also the refusal of the SPD to implement the ‘Hamburg Points’, a programme for the army giving powers to the soldiers’ councils that had been agreed by the National Congress of Councils. The USPD commissars were replaced by three more SPD representatives including Gustav Noske who, becoming responsible for the army and navy, quickly began organising the military forces of counter-revolution, the Freikorps (many of whom later in the 1920s joined the Nazis). By the end of 1918 the SPD had begun to deploy Freikorp units near Berlin in preparation for a blow against the revolution. In one sense, how the early stages of the German revolution unfolded was similar to that in Russia but, initially, at a much quicker pace. The November revolution had resulted in councils taking effective power in a number of cities like Hamburg. In Bavaria a ‘council republic’ had been declared, while in Saxony a manifesto jointly issued by the councils of Dresden, Leipzig and Chemnitz declared that capitalism had collapsed and the working class had seized power. In some areas armed workers’ units were formed to protect the revolution. Revolutions are characterised by the broad masses taking the stage and this was the case in Germany. Workers’ organisations grew extremely rapidly, partly as demobilised soldiers rejoined organisations but mainly because large sections of the working class took the first steps into activity. Trade union membership, 2.8 million in 1918, jumped to 7.3 million the next year. The SPD grew from 249,400 in March 1918 to over 500,000 a year later, while the left-wing USPD grew from 100,000 to 300,000 between November 1918 and February 1919. This sudden increase initially tended to push the more active, radicalised layers into a minority, as the newly active tended to have more illusions and hopes in the SPD and trade union leaders. This was also the case in the early days of the Russian revolution when the Bolsheviks, despite being the largest workers’ party before February, became a minority in the soviets as support went to the Mensheviks and Social Revolutionaries. But a combination of workers and peasants’ experience and the work of the Bolsheviks meant that within months they had regained majority support and were in a position to carry through the October revolution. This was something that the SPD leaders desperately wanted to stop happening in Germany. Consciously, learning lessons from Russia, they acted to prevent a successful overthrow of capitalism. It was not only the working class movement that learnt from the Russian revolution, the counter-revolution also became more conscious. Immediately after November Germany faced a situation of dual power. On the one hand the revolution had swept from power large parts of the old regime. For a few weeks at least the workers’, soldiers’ and sailors’ councils held real power, but this was not consolidated and the SPD leaders were working with the capitalists to neuter the councils and restore normal bourgeois government. But the SPD had to move very carefully because the revolutionary tide had not ebbed. Nevertheless, as happens in most revolutions, there came a time when sections of workers felt that their power was slipping away and the capitalist order was being re-imposed. In many cases, as in the ‘July Days’ in the Russian revolution, this can lead to spontaneous attempts to stop the revolution being rolled back. The SPD leaders were aware of this and moved to try to provoke the more radicalised workers into taking premature action, premature because the mass of workers had not yet drawn the same conclusions as they had. In the Russian revolution the Bolsheviks had understood this and sought to provide a leadership and strategy that would prevent the more advanced activists being isolated and enable them to convince the mass of the working class and poor of the actions needed to complete the revolution. But at this time in Germany there was no equivalent force able to play the role that the Bolsheviks did. The Spartacist League was formed only in mid-November 1918. Politically its leaders had a great standing in Germany. Karl Liebknecht, jailed after his May 1 1916 Berlin speech proclaiming “Down with the war. Down with the government”, had a huge prestige; Kautsky, the pre-war theoretical leader of the SPD, said he was “the most popular man in the trenches”. At this time the Spartacist League’s organisational strength was not clear; while it probably then had around 10,000 supporters its initial membership was a few thousand, although it started to grow quickly. From the outset there were debates within the Spartacists and the wider revolutionary left on how to work. From the USPD’s foundation Luxemburg, Liebknecht and the Spartacists had been active in the new party while maintaining their own group and publications and this had continued during the revolution with, for example, a big debate in Berlin in mid-December on whether the USPD should remain in the coalition government. At the same time there was another debate on whether the Spartacus, along with others working outside the USPD like the Bremen Left, should form a Communist Party. Luxemburg tended towards remaining in the still-growing USPD, at least until its next congress, while Liebknecht and others wanted to found a party immediately. While clearly an independent revolutionary party was necessary, it was also important to pay attention to what was happening inside the fast radicalising USPD. In fact later, in 1920, the Communist Party (KPD) became a truly mass force when it fused with the majority of the USPD. But at that time there was a great deal of impatience amongst many German revolutionary socialists. This was because of a number of factors, especially the urgent need to complete the November revolution, and help Soviet Russia, by overthrowing capitalism in Germany. In addition there was tremendous growing hatred of the SPD leaders because of what they had done during the war, the role they were playing now in the revolution and, increasingly, the SPD leaders’ willingness to bloodily suppress opposition on their left. It was against this background that when, at the very end of 1918, the KPD was founded, a majority decided, against the wishes of Luxemburg, Liebknecht and others, to abstain in the forthcoming elections to the national assembly. Unfortunately the majority did not see how, at that time, the elections to the assembly, the first ever fully democratic vote in German history, would have large support and that it was necessary for Marxists to use the elections to explain their position to those who would vote. At the same time the radicalisation in Berlin and some other areas led to an overestimation of the support then existing for another revolution to complete November’s. An illustration of this mood was when, on Christmas day, some Spartacists in Berlin published a paper which called for the immediate overthrow of the government and its replacement “by real Socialists, that is, by Communists”. One feature of the German revolution was that it unfolded at a different pace around the country. In different areas there were repeated attempts by workers to take control into their hands, but there was no national force able to give direction to these attempts, including judging what the best timing was or how to consciously win nationwide support. Tragically, although the government was too weak to simultaneously crush all the movements, the counter revolution utilised the different speeds to move around Germany step-by-step, especially in early 1919, city-by-city. But at the start of 1919 Berlin was the key, as the ‘dual power’ situation there was unresolved. In December the SPD government decided to organise a provocation in Berlin. Having gathered counter-revolutionary Freikorp troops outside the city, they ordered the removal of Berlin’s police chief, the USPD member Emil Eichhorn. The Berlin USPD, the Revolutionary Shop Stewards and the KPD called a mass demonstration for January 5 to defend Eichhorn’s position. The success of that protest convinced some of the leaders that it was possible to overthrow the government and an ‘Interim Revolutionary Committee’ was established. In this committee Liebknecht, supported by the later East German leader Wilhelm Pieck, argued in defiance of KPD policy that it was “possible and necessary” now to overthrow the SPD government. The next day, January 6, saw a bigger demonstration of around 500,000 workers, many armed, but they waited for hours in the rain before dispersing, as the Revolutionary Committee was unable to give any proposals on what they should do. This attempt to seize power was premature, falling for the SPD leaders’ provocation, who could picture it as an attack on the government, the councils’ majority and the forthcoming national assembly elections. It is probably the case that, on the January 5 protest, agent provocateurs encouraged the occupation of the offices of the SPD and bourgeois newspapers, not the most important immediate targets for a successful revolution, but a suitable target for the Freikorp troops. Although the revolutionary workers were probably strong enough to rule Berlin alone this was not the case in much of the rest of Germany, where illusions and hopes still existed in the SPD government. As was seen in other German cities in the following few months, at that time a victorious insurrection in Berlin would have probably been isolated and open to counter-revolutionary attack. On January 8 Noske’s troops began their offensive, politically dressing it up as a fight against ‘terrorism’. In a statement Noske, claiming to be defending the SPD’s history, said that he, “a worker, stands at the peak of power in the socialist republic”. The reality was brutally different. Noske was not joking when he said just before this battle “if you like, someone has to be the bloodhound. I won’t shy away from the responsibility”. Noske helped organise the Freikorps as a counter-revolutionary force one of whose tasks was to attempt to behead the revolution by killing the most well known Communists, Luxemburg and Liebknecht, and suppressing it in the capital, which was also then one of its most radicalised areas. Thus Liebknecht and Luxemburg were murdered by Freikorp officers on January 15, three days after the fighting had stopped. But while this bloody defeat was a major blow against the revolution and the KPD in particular, it did not end the radicalisation of the Berlin proletariat. This was reflected only a week after the suppression of ‘the Spartacus uprising’ in the national assembly elections, with the left-wing USPD winning 27.6% in Berlin, compared with 7.6% nationally, while the SPD’s Berlin vote was 36.4%, compared with 37.9% nationally. As the fighting in Berlin was coming to an end a council republic was proclaimed in Bremen and, after finishing in Berlin, Noske ordered Freikorp units to crush the movement there. But this in turn provoked mass strikes and fighting in the Ruhr, Rhineland and in Saxony and, at the beginning of March, a general strike and more fighting in Berlin. In other areas like Hamburg and Thuringia there was also a near civil war situation, while in Munich the council republic there was one of the last to fall, in early May. The November revolution showed the colossal power of the working class in modern society. The German workers were able to overthrow the virtual military dictatorship which ruled the country during the war and the imperial regime. They created workers’ and soldiers’ councils across the country, poured into political parties and trade unions, and demanded ‘socialisation’. They had the possibility of taking power in their own right but were blocked by the role of the SPD, the party that had originally been established to overthrow capitalism. German capitalism was only able to survive in 1918 courtesy of the Social Democrat leaders and they bear a major responsibility for the history of the rest of the twentieth century. Lenin, in the “happiest days in his life” initially hoped for the rapid victory of the German revolution. As it was starting, Lenin had been finishing writing ‘The Proletarian Revolution and the Renegade Kautsky’, a pamphlet arguing against the attacks of Kautsky, someone regarded before the First World War as the leading Marxist theoretician, on the Bolsheviks and the October revolution. The conclusion which still remained to be written to my pamphlet on Kautsky and on the proletarian revolution is now superfluous”. On the surface this may seem strange. Lenin had throughout his political life striven to build a revolutionary party, but now wrote that “power has passed into the hands of a Council” when a communist party had not even been founded in Germany, let alone won the support of the majority of the working class. In fact, Lenin did not in any way exclude spontaneous movements beginning a revolution and creating a ‘dual power’. In November 1918 he probably hoped that a Paris Commune-type situation could develop and that, with the example of Soviet Russia and the development of a communist party in Germany, the German revolution would consolidate itself, complete the overthrow of the ruling class thereby breaking the isolation of the Russian revolution and inspiring revolutions in other parts of Europe. The fact that this did not happen in 1918-1919 is not an argument against the importance of spontaneous movements, but illustrates their limitations. The course of the German revolution, and its eventual defeat, was an example of why a revolutionary party, armed with a clear programme and approach, was necessary to show how to end the rule of capitalism. However even when initially defeated in 1918-1919, the movement’s strength was strong enough to prevent the counter-revolution crushing all democratic rights. Hand in hand with bloody repression the counter-revolution was forced to take a partially ‘democratic’ form, even sometimes dress itself in ‘socialist’ phraseology – for the time being. This meant that there was still the opportunity for the KPD to learn from the experiences of the November revolution. Although capitalism survived this first round, the German revolution was not over as millions of workers moved to the left, stopped supporting the SPD and, by the end of 1920, made the KPD a truly mass force. However the tragedy is that when, after a series of heroic struggles, the KPD was able to get majority support from workers in 1923, it let the opportunity slip, with the disastrous consequences that instead of the world being completely transformed there was the rise of Stalinism, and then Hitler’s later victory, with all that those events meant for humanity. Previous articleFrance: Yellow Vests – Macron Resign! Defend Our Future!